I’m not going to explain how to draw these maps; that’s going to depend on your language, graphics library, platform, etc. 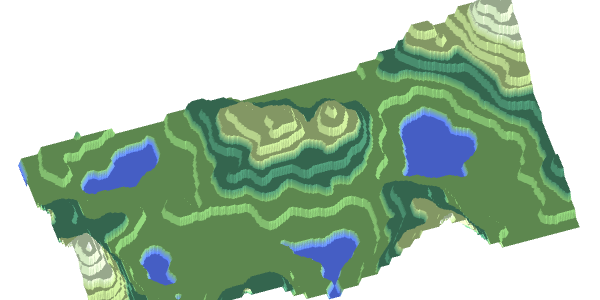 I’m only going to explain how to fill an array with height and biome map data. Depending on the library you use, you may have to shift or multiply the values you get back to fit into the 0.0 to 1.0 range. Yes, that’s it. The map data is the same, but now I call it elevation instead of value. Lots of hills, but not much else. What’s wrong? It’s just zooming in and out. That doesn’t seem very useful at first glance, but it is. I have another tutorial that explains the theory: things like frequency, amplitude, octaves, pink and blue noise, etc. It’s sometimes useful to think of wavelength, which is the inverse of frequency. Doubling the frequency makes everything half the size. Doubling the wavelength makes everything twice the size. The wavelength is a distance, measured in pixels or tiles or meters or whatever you use for your maps. It’s related to frequency: wavelength = map_size / frequency. Now that looks a lot more like the fractal terrain we want! We can now get hills and rugged mountains, but we still don’t get flat valleys. We need something else for that. The noise function gives us values between 0 and 1 (or -1 and +1 depending on which library you’re using). To make flat valleys, we can raise the elevation to a power. Move the slider to try different exponents. Higher values push middle elevations down into valleys and lower values pull middle elevations up towards mountain peaks. We want to push them down. I use power functions here because they’re simple, but you can use any curve you want; I have a fancier demo here. 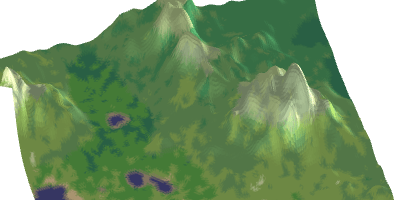 Now that we have a reasonable elevation map, let’s add some biomes! You’ll want to change all of those numbers to match the needs of your own game. 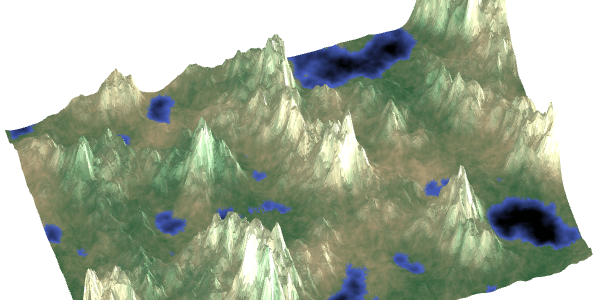 With either biomes or gradients, one noise value doesn’t produce enough diversity, but two is pretty good. Near the poles (high latitudes) the climate is colder, and on the tops of mountains (high elevations) the climate is also colder. I haven’t done much with this yet; there’s lots of tweaking needed to get these parameters right. There’s also a seasonal variation of climate. In summer and winter the northern and southern hemispheres get warmer and colder, but the equator doesn’t change as much. There’s lots more that can be done here, such as modeling prevailing wind and ocean currents and the biome’s effect on climate and the ocean’s moderating effect on temperatures. For some projects I want the boundaries of the map to be water. 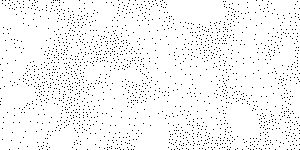 One way to do this is to generate a map as above and then reshape it. How does this work? 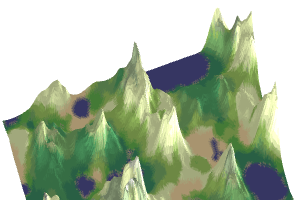 In a side view, the original noise terrain fits into a containing rectangle . To make islands, we reshape the container into something like . This pushes the middle up onto land and the edges down into water. The simplest shape is , formed using e = (1 + e - d) / 2 where 0 ≤ d ≤ 1 is the distance from the center (either Manhattan or Euclidean or a mix). This shape guarantees the middle is on land and the edges are in water, but it’s overly aggressive. Design a shape that matches what you want from islands. Use the lower shape to push the map up and the upper shape to push the map down. These shapes are functions from distance d to elevation 0-1. Set e = lower(d) + e * (upper(d) - lower(d)). In the lower shape doesn’t push at all, so the middle of the map is not guaranteed to be on land. 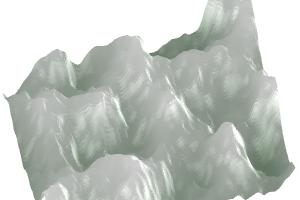 This allows more of the underlying Perlin/Simplex noise to show through. The upper shape pushes down anything away from the middle of the map. In the upper shape is less aggressive, pushing down only near the edges, and the lower shape mildly pushes upwards near the middle. There are many other shapes to try! Why stick to standard mathematical functions at all? As I explored in my article on RPG damage, everyone (including me) uses mathematical functions like polynomials, exponentials, etc., but on a computer we’re not limited to those. We can draw any shape and use it here. Put the lower and upper shape in lookup tables and use them in your lower(d), upper(d) functions. I don’t have much experience with this technique and will have to play with it more to learn how to use it well. It might also be interesting to mix ridged low frequency noise with non-ridged high frequency noise. This is an application of elevation redistribution functions of the form e = f(e). Earlier we set e = Math.pow(e, exponent) to make mountain peaks steeper; here we use e = Math.round(e * ) / to make terraces. 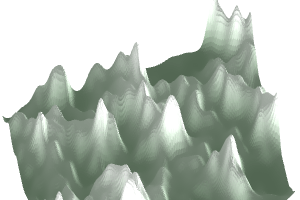 By using a function other than a step function the terraces can be rounder or only occur at some elevations. 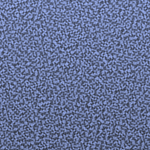 It’s cool that Perlin/Simplex noise can be used to place trees, but other algorithms, such as Poisson discs, Wang tiles, or graphics dithering, are often more efficient and also produce a more even blue noise distribution. The calculation of the biome at position (x,y) is independent of calculations at any other position. This local calculation results in two nice properties: it can be calculated in parallel, and it can be used for infinite terrain. Put the mouse over the minimap on the left to generate a map on the right. We can generate any part of the map without generating (or having to store) the whole thing. Once you have found a noise library for your favorite language, the details will vary (some will return numbers from 0.0 to 1.0 and others from -1.0 to +1.0) but the basic idea is the same. For a real project you may want to wrap the noise function and the gen object into a class but those details aren’t relevant here so I made them global. For this simple project it doesn’t matter that much whether you use Perlin noise, Simplex noise, OpenSimplex noise, value noise, midpoint displacement, diamond displacement, or an inverse Fourier transform. There are pros and cons of each of these but they all produce similar enough output for this type of map generator. 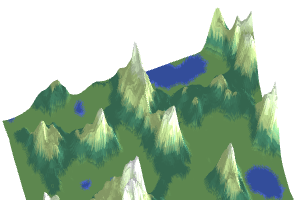 The drawing of the map is going to be platform-specific and game-specific so I’m not providing that; this code is just to generate the elevations and biomes, which you’ll want to draw yourself in whatever style your game uses. Feel free to copy, port, and use it for your own projects. What I like about this approach to map generation is that it’s simple. It’s fast. It’s very little code to produce decent results. What I don’t like about this approach is that it’s limited. Local calculation means every location is independent of every other location. Different areas of the map don’t relate to each other. Every place on the map “feels” the same. There are no global constraints like “there should be between 3 and 5 lakes” or global features like a river flowing from the top of the highest peak down to the ocean. 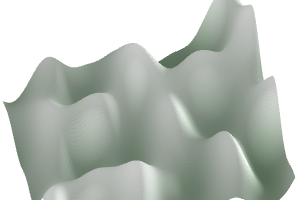 Another thing I don’t like is that it takes a lot of tweaking of parameters to get something you like. Why do I recommend it then? I think it’s a good starting point, especially for indie games or game jams. Two of my friends wrote the initial version of Realm of the Mad God in 30 days, for a game competition. They asked me to help them make the maps. I used this technique (plus some extra features that turned out not to be that useful) to make a map for them. Months later, after getting feedback from players and looking at the game design a lot more, we designed the more advanced map generator using Voronoi polygons, described here. 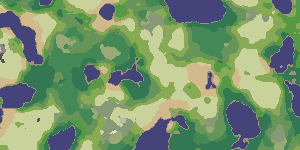 That map generator doesn’t use the techniques from this page, but uses noise very differently to produce maps. Noise-based elevation is fun and easy to get started with but you can quickly run into limits. Scott Turner has an insightful essay with reasons to use alternatives. 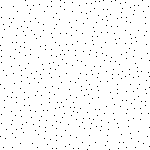 There are lots of cool things you can do with noise functions. If you search the web you’ll see variants such as turbulence, billow, ridged multifractal, amplitude damping, terraced, voronoi noise, analytical derivatives, domain warping, and others. Take a look at this page for inspiration. I’m not covering them here; instead I’m focused on simplicity for this article. 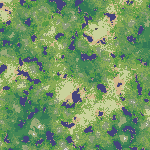 I used generic Perlin noise for my first Realm of the Mad God map generator. We used that for the first six months of alpha testing, and then replaced it with a custom-designed Voronoi polygon map generator based on the gameplay needs we identified during the alpha testing. The biomes in this article and their colors come from those projects. While studying signal processing for audio, I wrote a tutorial on noise that covers concepts like frequency, amplitude, octaves, and “colors” of noise. 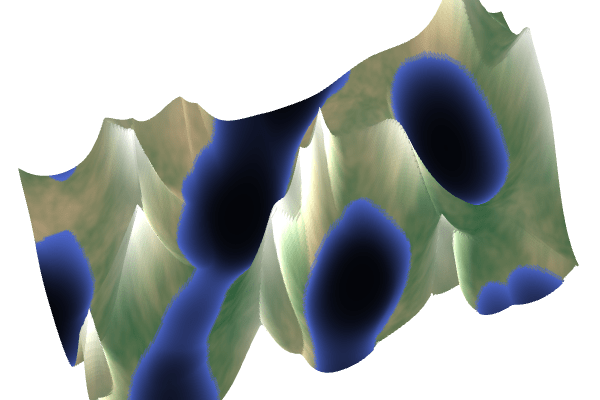 The same concepts that work for audio also apply to noise-based map generation. I made some unpolished terrain generation demos at the time but never finished them. Sometimes I experiment to find limits. I wanted to see how little code I could get away with while still producing reasonable maps. In this mini-project I got down to zero lines of code— it’s all image filters (turbulence, threshold, color gradients). I was both pleased and disturbed by this. 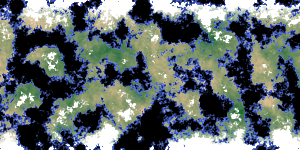 How much of map generation can be done with image filters? Quite a lot. Everything in the “smooth gradient color scheme” I described earlier came from this experiment. The noise layer is a turbulence image filter; the octaves are images layered on top of each other; the exponent is called the “curves adjustment” tool in Photoshop. It bothers me somewhat that most of the code we game developers write for noise-based terrain generation (including midpoint displacement) turns out to be the same as audio and image filters. On the other hand, it produces decent results with very little code, so that’s why I wrote the article you’re reading. It’s a quick & easy starting point. I usually don’t use these types of maps for long; I’ll replace them with a custom map generator once more of the game is built and I have a better sense of what types of maps best match that game’s design. That’s a common pattern for me: start with something extremely simple, then replace it only after I better understand the system I’m working on. There are a lot of cool things you can do with noise, and I’ve barely explored them here. Try out the Noise Studio to interactively explore lots of possibilities.